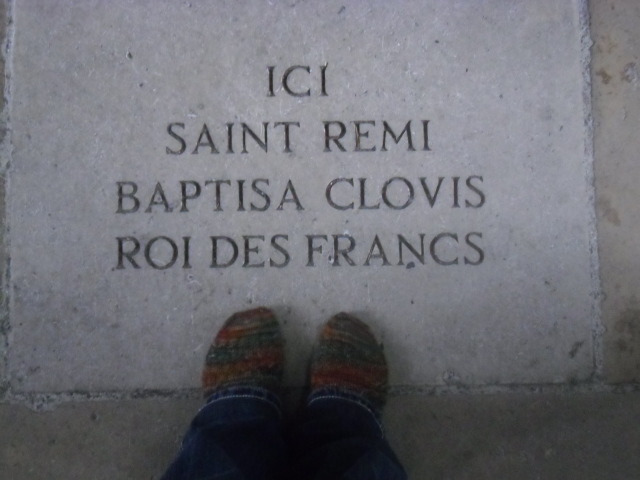 The reason Stacy Lyn dragged took us Socks to Notre-Dame de Reims Cathedral is not only because of its phenomenal beauty, but moreso because of its connection to the French monarchy – kings were coronated there since time immemorial. And of course, Clovis of the Franks – yes, that would be THE Clovis – was baptised there way back in 496 a.d. He’s like a Frankish rock star! (Kind of cute, too.) Here we are standing on a plaque that commemorates this monumental occasion in European history. Ok, we’ll confess, we Socks like churches as much as Stacy Lyn does. We were wowed by the sheer magnitude of the place – the manpower, artistry, and insight that went into building this place that really is a testament to man’s connection to the ethereal.